The decision really has to be made on what you're looking for in a sub-£200 phone. If design is important, then there's quality here that some rivals offer, as well as that big display. But at the same time, if you have budget concerns, then the Moto G5 is more attractive in a more wallet-friendly position. Nokia's leap into Android smartphones has been very much dominated by design. It seems to be the focus of the new HMD Global-led Nokia brand, with strong design running through the Nokia 3 right up to the new Nokia 8. 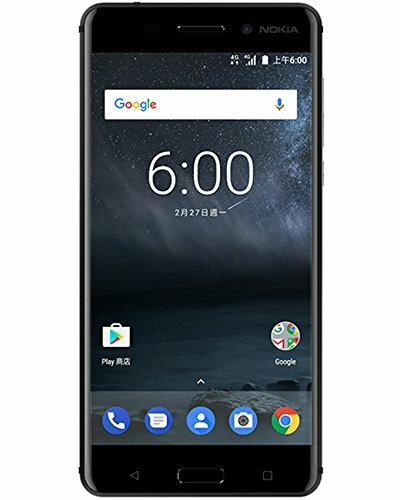 The Nokia 6 was the top-tier phone of the original launch trio (alongside the Nokia 3 and 5 - prior to the 8's later announcement), squaring up against the likes of the Moto G5 and wanting to take its place in the annals of budget smartphone history. It's been a long time coming though: announced in February and only becoming available in August, does the Nokia 6 still hold the interest it offered at its initial announcement? Nokia has made a lot of noise about the quality of manufacture of the Nokia 6 and if a phone was judged only by its build and design, then it would be plain sailing for Nokia. A solid metal body, with antenna bands tracing the top and bottom ends of the phone, make for a discreet but quality finish. There's a slight curve to the phone's back, meeting flattened sides with the edges getting a neatly chamfered finish. For the black version of the phone this gives metal highlights, adding detail that's reflected in the side buttons and ringing of the camera on the rear. Those edges are a little sharp to the touch, but this is a big phone that's easy to grip as a result. Nokia hasn't gone for the full 2.5D glass front, so the glass doesn't "pop" with a curve from the edge of the device, but there's a slight curve off towards the edges before it hits the chamfer. To the top edge of the phone you'll find a 3.5mm headphone jack; to the bottom edge is a Micro-USB connector. Yes, HMD Global has stuck with the older standard for the Nokia 6, a mark of its budget status, rather than venturing into USB Type-C like so many of its competitors. The overall impression is that the Nokia 6 is a solid phone, something that's welcome in the sub-£200 space. We'd say it's more substantially built than the new metal Moto G5, meaning that Nokia takes a win when it comes to design - even just glancing at the two phones, the Nokia looks more metal on account of its chamfers. The Nokia 6's hardware story reads very much as par for the course for a budget handset. The Qualcomm Snapdragon 430 platform is common to any number of budget devices - including the smaller Nokia 5 - as well as its biggest rivals. It's very much an entry platform for Android devices, but it is at least paired with 3GB of RAM to ensure plenty of apps and data can sit in the sidelines. The performance is reasonable for daily tasks like keeping on top of your emails and social media, but this isn't a phone that will meet the demands for more advanced users. It's not great for gaming, as things can be a little slow to load some games won't be able to run on higher graphics settings. For example, fire up Total War Battles: Kingdom and you'll find most of the textures stripped out so the game can run. Lighter games are ok, but be aware that they will take some time to load. That's also something you might find handling apps compared to powerful phones: download and installation is typically slower, but it'll get there in the end. Perhaps the most irritating performance issue is how slowly the camera launches. However, the Nokia 6 isn't alone in this - it's a symptom of its lower power positioning. At the end of the day, if you want to stream the latest Netflix series or listen to your favourite Spotify tracks the performance is perfectly capable. Just don't let the exterior design fool you that you're getting premium power. Overall, the performance is what you'd expect from a budget device, although the Nokia's £199 asking price sits a little higher than we'd perhaps want to pay: the Lenovo P2 has the more powerful Snapdragon 625 and costs the same, the Moto G5 has the same internals but is £40 less. There's 32GB of storage in the Nokia 6, plus the option to add a microSD card to boost this storage space further. The 3,000mAh battery sounds good on the spec sheet, but its performance isn't really that strong in this device. We've seen better performance from smaller capacity batteries in more powerful phones. This might have something to do with driving the big display (more on that in a moment), or it might be that it's not as well optimised as some other devices. You might make it through the day, but we rarely did. This is compounded by the lack of fast charging, meaning you'll need to be connected for three hours to get this Nokia back up to 100 per cent, rather than an hour that some rivals now offer. There's also a front fingerprint scanner which gives reasonable unlocking speeds. It's not as snappy as the best we've seen from Huawei, for example, but the convenience it offers over some devices that lack a biometric unlocking method can't be overstated. One of the big selling points of the Nokia 6 is that it has a large display. At 5.5-inches, it gives you a little more size than some of the devices in this price bracket. It sticks to a conventional 16:9 aspect and with a Full HD resolution, which is detailed enough to give you a smooth visual experience for most of your content. We're not convinced that it's the most natural when it comes to colours - it's a little on the warm side, so the whites don't really shine - but it's a lot better than the Nokia 3. Although the Nokia 6 has a 450-nit display, it sometimes seems reluctant to get to that degree of brightness (even though that would compound the battery problems that this phone faces), so you may have to manually adjust the brightness yourself at times. There's another small problem: the orientation of the polarising layer on the display. Hold the phone in landscape when wearing polarising sunglasses and it will black out entirely, making camera use in sunny conditions a pain. Naturally, this won't affect everyone (it depends on the polarisation of your sunglasses), but many manufacturers have got around these problems, like Apple and Samsung. Overall, it's the size that really matters in the Nokia 6. You may find 5.5-inches too wide for a phone, but if you want the extra real estate then we can't take away from Nokia that there's plenty of space to watch your movies or bash out your messages on this device. There's a 16-megapixel camera on the rear of the Nokia 6 and, as we've already mentioned, it can be a little slow to launch. Double-tap the power button and it will open, but it takes about four seconds to get there. Once in the camera app - something that's bespoke to Nokia Android phones - and things are fast enough to navigate, with quick access to photo or video, and left-hand UI controls for switching cameras and handling HDR (high dynamic range). HDR has seen a boom in recent years, with auto HDR now playing a major role in driving the best smartphone cameras in the business to ensure balanced exposure between highlights and shadows, so you don't need to fiddle around with manual adjustments to get the best results with ease. That's something the Google Pixel and Samsung Galaxy S8 manage far better, for example. Nokia's take on HDR has an important role to play in helping the camera get the most out of what it sees, but it's a little unreliable in auto mode. That might mean that you have to take a picture and then reshoot once you've looked at the results and manually turn HDR on, to pull some extra detail out of the shadow areas. Results in good light are perfectly satisfying, but the performance drops off rapidly as the light drop; in darker conditions there's little sharpness as things get mushy due to processing. That's common to many phones, but the Nokia 6 has a slightly narrower window where it performs well, compared to some of the better phones on the market. Unless you're HTC, very little gets said about the speakers on phones. While the Nokia 6 has a 3.5mm headphone socket for those on the move, one of the surprising things about this device is how good the speaker performance is. Hidden in the settings is a Dolby Surround Sound mode which gives the speakers a very positive boost - with two modes for music or theatre. In a similar approach to HTC's BoomSound HiFi Edition, the Nokia 6 uses both the ear speaker and the base speaker to produce a wider and more detailed soundscape than many phones. That's great for watching adhoc movies on YouTube or playing games without headphones. When it comes to music, it also performs well and you can crank it up to full volume with very little distortion. It's a minor thing, but very much a positive. Nokia's promise to deliver a clean Android software experience rings true in the Nokia 6, with the only changes coming in the form of that bespoke camera app and a Nokia support app. Compare that to many budget phones - some of which will change the launcher, add services and duplicate functions - and Nokia looks in a better position. This also has the added advantage that things like Android security patches are delivered promptly. At the time of writing, the Nokia 6 is up to date - which is a real benefit. Whether that will translate into a quick upgrade to Android O, however, remains to be seen. On the whole we've found the software experience to be smooth enough. As this is pure Android there's little to get in the way of what you want to do. The speed is ultimately limited by the hardware platform, but as we've said, used as a daily phone for the last three weeks, we've found the Nokia 6 to be perfectly capable of delivering Google services, handling Maps and all the other important stuff. The Nokia 6 is a slightly confusing device. The quality of the design and build would perhaps suit a phone with more ambitious hardware inside. Ultimately the experience is dictated by that entry-level hardware and this is very much par for the course when it comes to affordable phone performance. There are a few points that niggle, particularly that there's no support for Quick Charge - something that the Snapdragon 430 platform supports - and that the battery life doesn't last that long. The Moto G has dominated the affordable end of the Android market, being the go-to phone for those who can't stretch to flagship prices. The Moto G5 continues this trend, offering plenty for the asking price, including a fingerprint scanner a great metal body. The specs are close to those of the Nokia 6 albeit with a smaller display, but this phone is about £40 cheaper. The Lenovo P2 is something of an oddball in that it's been designed with really only one thing in mind: long battery life. As such, this is an affordable phone that takes a step-up in hardware spec compared to the Nokia 6, but then has a huge battery - meaning it has a really attractive offering.